Trevor Pateman's Philately Blog: Much scarcer than Russia Number 1 on cover? This is my favourite recent acquisition. What and why? In June 1919, the Volunteer Army forces of General Denikin captured Kharkov from the Bolsheviks, who had returned after the withdrawal of German forces at the end of 1918. The Volunteer Army held on until the end of 1919 when the Bolsheviks re-took the city. 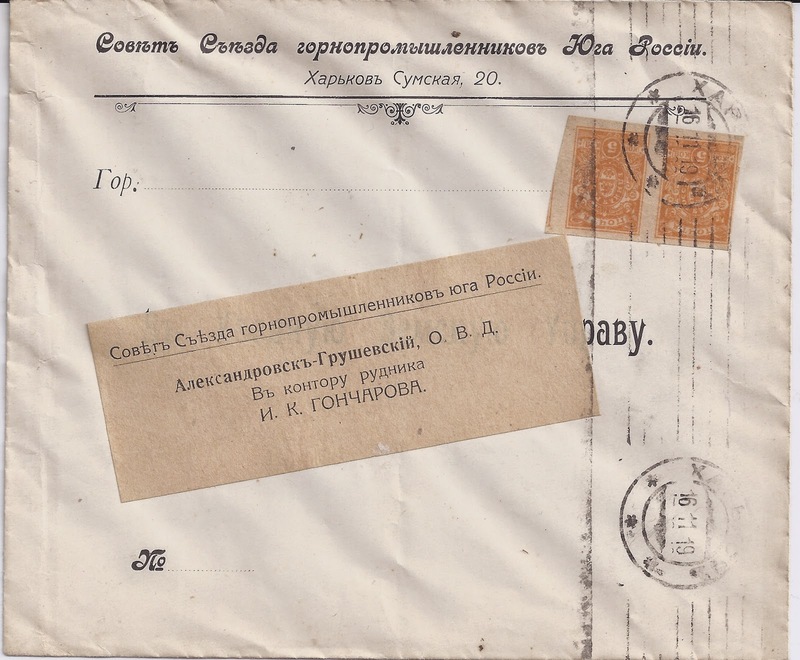 This letter from a South Russian mining organisation located in Kharkov (I can't manage a word-for-word translation) was sent as unsealed Printed Matter to a mine in Alexandrovsk - Grushevski, then in the Don Cossack Oblast with a population of 50 000 and many mines. Today it is Shakhty in Russia, northeast of Rostov on Don. It got its new name (which means "Mine") in 1920 and hosted the first of Stalin's show trials in 1928 when fifty-odd mining engineers were accused of wrecking and sabotage as agents of the former mine owners. Later, it was home to a serial killer, Andrei Chikatilo - the subject of a film Child 44 currently causing controversy in Russia. The stamps are roller cancelled KHARKOV 16 11 19 and there is a receiver cancellation on the back dated 23 11 19. The 10 kopeck franking here compares with a 35 kop or later 70 kop tariff for ordinary letters and double that for Registered letters, so it's a cheap rate - just like the cheap Imperial printed paper tariffs. I don't think I have previously seen this Tariff in operation. I also don't think I have seen a cover franked exclusively with the lowest value in the Denikin series - the 5 kopeck orange which keeps the colour of the Imperial 1 kopeck but increases the face value to 5 kopecks ( the Denikin 10 kopeck green parallels the Imperial 2 kopeck and the 15 kopeck red parallels the 3 kopeck). Maybe there is a whole heap of these Printed Matter covers out there - send me scans! - but my guess is that you will find it much easier to find a Russia Number 1 on cover - even a pair of Russia Number 1's on cover - than to find another commercial cover with this franking.